Lubick, known as an ace recruiter, spent four years on the Ducks' coaching staff. He spent the past six weeks as the co-offensive coordinator at Baylor. 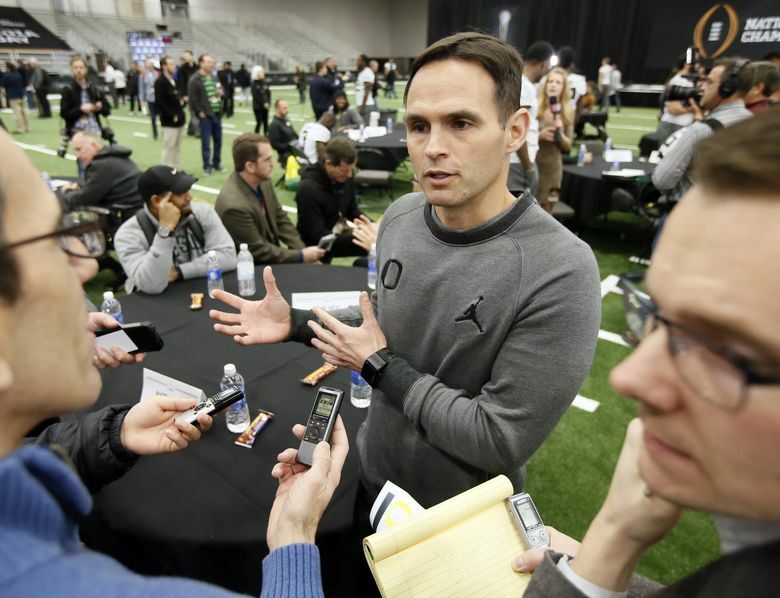 Washington coach Chris Petersen has filled the opening on his staff, hiring former Oregon offensive coordinator Matt Lubick as the Huskies’ new co-offensive coordinator and wide receivers coach, the school announced Wednesday. Lubick replaces Bush Hamdan, who was named the Atlanta Falcons’ quarterbacks coach last week. As co-offensive coordinator, Lubick reunites with UW offensive coordinator Jonathan Smith. Lubick was an assistant coach at Oregon State in 1999-2000 when Smith was the Beavers’ starting quarterback. This is Lubick’s fourth coaching job in the Pac-12 Conference. Lubick spent the past four seasons on the staff at Oregon, the first three as wide receivers coach. He was promoted as offensive coordinator in 2016, and the Ducks finished the season ranked No. 15 nationally in total offense, despite turning to a true freshman quarterback midway through the season and starting four freshmen on the offensive line. Lubick was not retained when Oregon fired head coach Mark Helfrich after the Ducks stumbled to a 4-8 finish last fall. That started a wayward offseason for Lubick, who in December joined the Ole Miss staff as wide receivers coach. Two weeks later, in early January, he was hired as Baylor’s co-offensive coordinator. UW, then, is his fourth coaching job since the end of November. Counting those brief tenures this offseason, UW is the 12th stop in a 21-year coaching career for the 45-year-old Lubick. In 2012, he was named the nation’s Wide Receivers Coach of the Year by FootballScoop.com while working as the receivers coach at Duke. A native of Bozeman, Montana, Lubick was an NAIA All-American cornerback as a senior at Western Montana College. Lubick’s father is Sonny Lubick, who was the defensive coordinator on Dennis Erickson’s staff at Miami from 1989-92. Sonny Lubick was the head coach at Colorado State from 1993-2007, becoming the winningest coach in school history. In 1995, Matt Lubick got his start in coaching as a student assistant coach and academic supervisor under his father at Colorado State. Lubick has also coached at Cal State Northridge (1996), San Jose State (1997-98), Oregon State (1999-2000), Colorado State (2001-04), Ole Miss (2005-06), Arizona State (2007-09) and Duke (2010-12). Details of Lubick’s contract with UW were not immediately made available Wednesday. Smith, meanwhile, is expected to sign a new contract soon. His one-year deal for 2016, which included a base salary of $440,000, expired at the end of January. Entering his fourth season as a UW coordinator, Smith oversaw an offense that last season led the Pac-12 in scoring at 41.8 points per game, a school record.